I can eat mangoes any time. I love this fruit. While I was reading a post in Ramya Bala's blog, I came across this recipe which tempted me to try and I followed the same recipe with some changes. Here is the recipe I followed. Preheat oven to 400 degrees. In a bowl, mix all the dry ingredients well so that it mixes together. In a separate bowl, beat eggs adding a teaspoon of water. Add it to the dry ingredients along with mango pulp and mashed banana. Mix the batter well so that no lumps are formed. Arrange the muffin cups and fill the cups with 3/4th of batter. Bake it for 15 mts or until it becomes golden brown. Check it inserting a tooth pick and it should come out clean. The final result was really amazing. My husband said, it tasted like banana nut muffin. But i didn't added nuts. May be next time I will add nuts instead of mango pulp. looks good! heavily into baking these days, huh? ha ha.. no yaar. this was really tempting and i like mangoes. I am really busy with my twins now a days. both were sick on and off.. 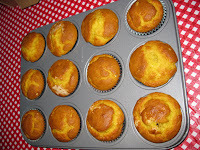 I love muffin, those look so delicious, sure I am gonna try them , my kids are gonna love them.Thanks for sharing it ! Wow looks moist and yum. Muffins looks tempting and looks awesome & yum.. bookmarked this recepie vidhya..Hope kids love this yummy muffins.Thanks for sharing it ! 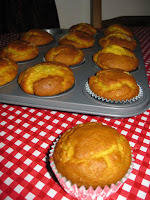 i love anything with mangoes....ur muffins looks great..